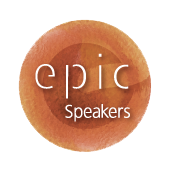 So You Want to Be an EPiC Speaker? What do you want your audience to DO (something tangible) as a result of hearing you speak? Who is your audience? What is their pain? What are their triggers – are they driven intellectually, spiritually, emotionally, physically? Do they react with their head, heart or gut?! Now plan your message – be fluid and organic in approach – avoid unnecessary slides, too much content and think in pictures – use mind mapping to help it stick with you as well as your audience. What does this mean? It means that the situation where you are at any particular time, the conversation that you are having at any particular moment, the speech you are making at any particular occasion is the most important thing to you at AT THAT VERY MOMENT. You are 100% involved with the audience and environment around you. All thoughts and fears outside this environment are secondary. Your primary focus is right here, right now! The next layer is to ensure that everything you do and say in that environment is done deliberately – with control. This starts with your breathing, then your verbal delivery (the words you use), then your vocal delivery (pausing, pace, tone, volume, etc) and then your physical delivery (body language, body dynamics, etc). The secret ingredient (every EPiC speech has one!) is what level and type of risk you are prepared to take when engaging your audience. This is usually the clincher when achieving action. Examples include the type of stories you share, the level of physical connection you have with your audience, the types of images you use on your slides, the questions you ask. In other words, a variety of triggers are available to you to make your own, enjoy, and use to connect with your audience. This takes you back to your purpose. 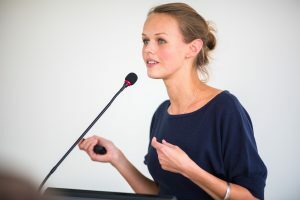 Throughout your message you will need to remind your audience and yourself about what it is that YOU WANT THEM TO DO AS A RESULT OF HEARING YOU SPEAK. What is it, specifically, that your audience needs to do to take action? This will be done through stories, analogies, observations, reflections and the most powerful of all – repetition! Another word for repetition is reinforcement.